TRANSFORMING CARRY BAG. The integrated cover means you simply place the bag on the table, fold down the corners and fold the sides of the cover down to drape the table. Never worry about losing the carry bag again. LIGHTWEIGHT BUT STRONG. 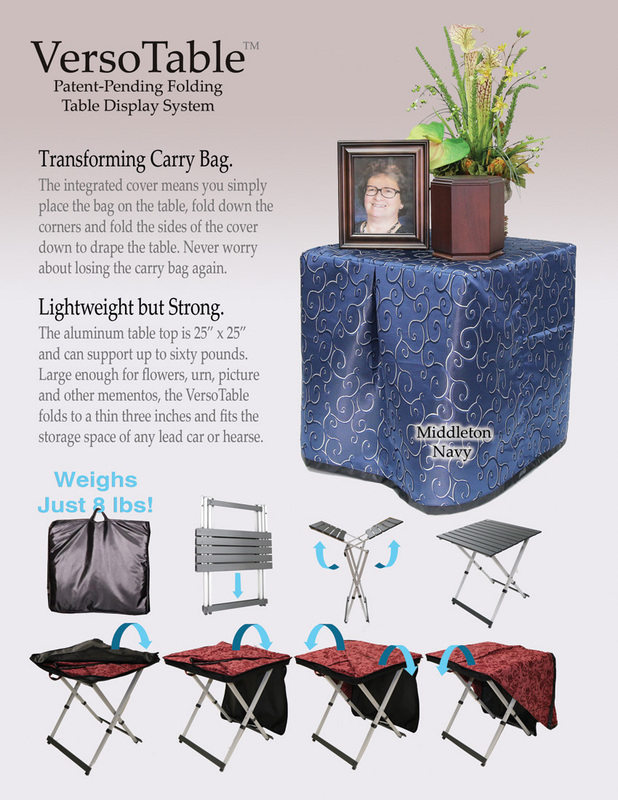 The aluminum table top is 25� x 25� and can support up to sixty pounds. Large enough for flowers, urn, picture and other mementos, the VersoTable folds to a thin three inches and fits the storage space of any lead car or hearse. INTERCHANGEABLE. Honor their service with the included patches (Army, Navy, Air Force, Marines) or use the solid black table cover on its own. You may also purchase optional emblems for more personalization. Additional selections include Masonic, Coast Guard, First Responder, Ohm, Star of David, and others.